Prague downtown is full of great hidden gems waiting for your visit. There are hundreds of people daily passing their locations without knowing there might be something special. This blog post is dedicated to very important Prague sights which are commonly overlooked by tourists and guide books. Today I would like to introduce you: Great South Tower of St. Vitus Cathedral, lovely Baroque Vrtba Garden located in Lesser Town and also one of the latest additions to Prague street art – Giant head of Franz Kafka. Three hidden gems you shouldn´t miss In Prague downtown. From the very top of this tower which many people simply miss is a stunning, 360° view of Prague. 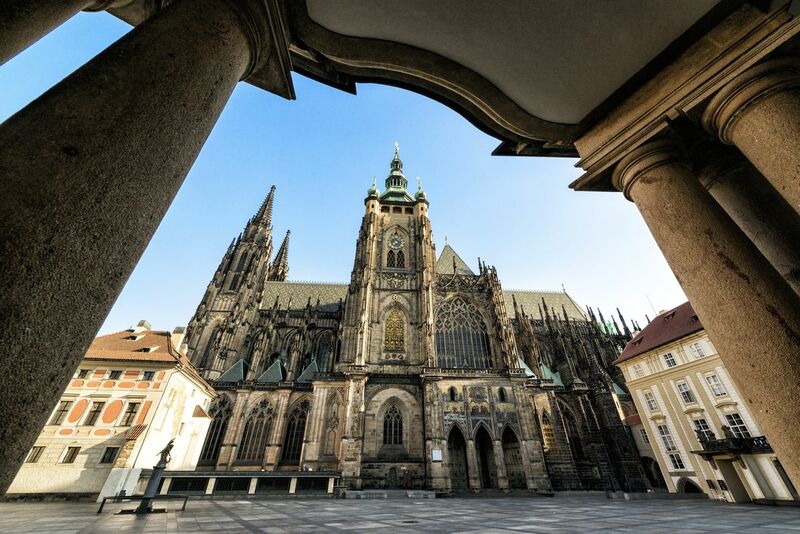 You are also overlooking roof and spires of the impressive and monumental St. Vitus Cathedral. This Great South Tower is part of the Cathedral, however has a different entrance and you need extra ticket (150 CZK) to get inside, but I promise it´s worth it. There is no elevator so you need to walk up nearly 300 steps to get there. The view from 100 m high tower is amazing! My personal tip: Along the way to the top you can also admire the biggest bell in the Czech Rep. called Zikmund. If they want to make it move, 6 people need to come. It weights 15 tons. 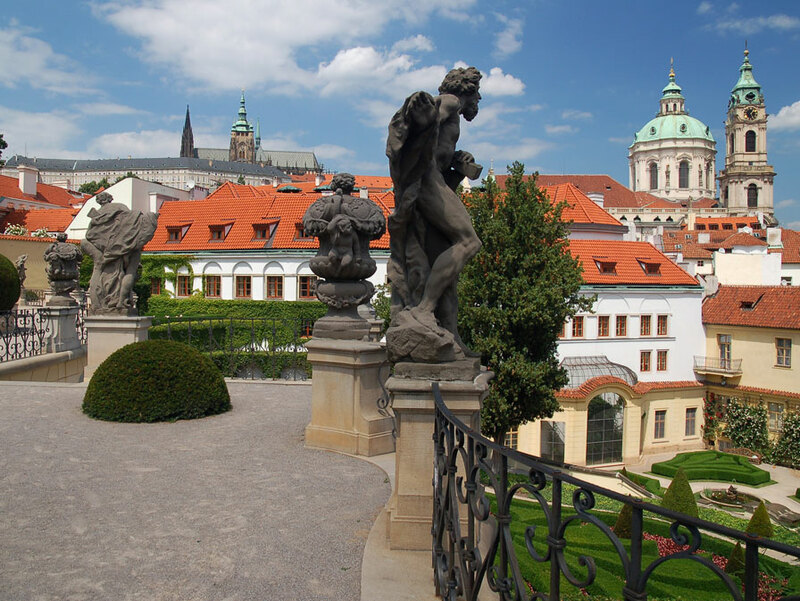 Locals and Prague visitors love this place because the garden looks like from a fairytale. This historical spot is well hidden behind houses situated on very busy street of Prague Lesser Town (Malá Strana in Czech language). However, on the other side of the house you will find yourself in completely different world. In 18th century. Vrtba garden is considered to be one of the most beautiful Baroque gardens in Europe, founded in the begining of the 18th century. The area is quite small so you don´t need to count with so much time to spend there. The garden is a Class 1 cultural monument registered in the UNESCO World Heritage List. It is a bit arguable if this is something what can be called hidden as it is really huge piece of art 🙂 We are trully fascinated by the mechanism, motion and reflections of this Kafka´s bust. The sculpture is constantly rotating as it is made of 45 moving layers. Its total height is 11 m. So it is not only cool but also giant! If you are a fan of modern, progressive art, this should be one of your next stops. I highly recommend to shoot a video here, it is very difficult to describe or capture the whole mechanism. Kafka´s head is the latest art peice of slightly controversial Czech artist David Černý. Very nice and playful addition to this otherwise sleepy square. Interesting fact: Černý just recently installed very similar sculpture on the world’s largest cruise ship called Harmony of the Seas. Did you like my off-the-beaten-path tips and would you like to see them? Feel free to contact me for customized private “behind the scenes” tours.